From reading the words of Jesus, Paul, John, and others in the Bible, it appears obvious that their conception of the type of Christian fellowship we are to have is much more than merely standing up in our pews and shaking hands with the people around us when the pastor states that it is “greeting time”. It is even much more than offering to pray for someone, or quoting Bible verses to them if they have a problem, nice as those actions are. No, they had much, much more in mind. John stated, “But if we are living in the light of God’s presence, just as Christ does, then we have wonderful fellowship and joy with one another, and the blood of Jesus his Son cleanses us from every sin” (I John 1:7). Peter wrote, “You should be like one big happy family, full of sympathy towards one another with tender hearts and humble minds” (I Peter 3:8). Moreover, whether on present-day earth or in the heavenly Kingdom after bodily death, Christians need to possess personalities and spirits which are capable of true unity, or oneness with God’s work and with one another. “My prayer for all of them is that they will be of one heart and mind, just as you and I are, Father – that just as you are in me and I am in you, so they will be in us, and the world will believe you sent me. I have given them the glory you have given me – the glorious unity of being one - I in them and you in me, all being perfected into one – so that the world will know that you sent me and understands that you love them as much as you love me” (John 17:21:22). Sounds to me like that’s real closeness! Wow! Well, first of all we need to be committed Christians seeking to become more and more like Christ as we go through our years. That’s a “given.” Then, we certainly need to practice, practice, practice, Here’s a list for your thoughtful consideration which, hopefully casts the words of Jesus and the apostles in practical, modern-day terms, that will describe what we should be practicing. I hope this will be of benefit. · Christians should be interested in getting to really know one another and be good friends. The model Christ gave us suggests that John seems to have been his favorite friend, with Peter and James very close, too. Then, he had his whole group of 12 disciples. He had his mother, and quite a few other close friends. He was very attentive and relatable to many, many people. So, too, we can’t be “best friends’ with everybody, but probably develop a “pyramid” of relationships, with the closest at the top. · We need to be “as Christ” to one another – loving, and also the best humans we can be. Christ was “there” for others. We should be confidence building and give assurance and encouragement. · Growth in sensitive communication and nurturance skills is very important. Not all of us have had the opportunity to enlarge our skills in those areas. · Growth in compassion, empathy, and understanding is crucial. Seek to have insight into how it would feel to be in the other person’s (or animal’s) position or plight. · Defensiveness and manipulative devices should never be part of our relationship manner. We should be transparent, real, and forthright. · A family atmosphere of true inclusiveness should be developed, in that everyone is interesting and important and needs social ties. At gatherings, no person should be ignored with no one to talk to. Although personal friendships hopefully develop, “clicks,” with folks perpetually hovering around each other are really destructive. · Meekness and humility should reign. Although roles and their responsibilities should be respected, no one is ultimately any more important than anyone else. The “top dog” mentality really discourages others. · Good manners should always be practiced. Remember Emily Post? Good manners are considerate manners, and they give people a pattern for relating well in social situations. They build confidence and trust. · Foster healthy interpersonal closeness and sharing. Pray for one another and minister to one another. Call one another and get together outside of church-related occasions, as well as within them. Have fun together. People need some fun. · If we have injured or been inconsiderate, take responsibility for our mistake and make amends. Also, if we have been injured and the injuring person is trying to make amends, be gracious and accepting. Work things out well. · Of course, jealous “turf battles” should be avoided absolutely. Our mental goal priority should “How can I best cooperate,” rather than “How can I dominate and get the most favored position,” or whatever. · We need to be careful of our motives when we make a friend. When we make overtures for friendship with someone, we need to be careful that we have a sincere interest in the person and that we have genuine commonalities to support a sustained relationship. In other words, we should really avoid “buddying up” with someone during a temporary situation, or because of a temporary need we may have, when they have been led to believe we are their friend. Then, when the situation or need changes, they are dropped. There is a real difference between an acquaintance and a real friend. Being abruptly dropped by someone the other person believes is a friend can be really hurtful. We need to be faithful to real friends. The fundamental goal is to have relationships growing towards oneness of heart and mind over time. Not only oneness of heart and mind in terms of what we believe about God the Father, Son, and Holy Spirit, but also oneness in sharing a whole life with one another because we truly love and value one another as individuals. Then, Jesus promised, we will all have a secure place in a spiritual and earthly community. Then, we will have the joy he promised. Also, the better we hone our gentle, cooperate, kindly considerate relationships skills, with our hearts behind them, the better we will be a healing and helping factor for the others we come into contact with – humans and animals. Sure, we will end up being different than most people in our current culture. We will have to tolerate being different. It is unavoidable! Jesus was extremely different! The more like Christ we are relating, the more different we will be! But, God the Father, Son, and Holy Spirit are there with us, and so are those in our true fellowship circle – our earthly family. What could be better? 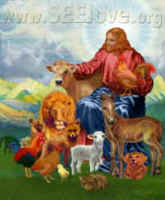 Go on to: Is a Vegan Lifestyle God’s Will for Humankind?